In this Photoshop Effects tutorial, we're going to learn how to easily create an old-fashioned, hand-tinted photo effect. All it takes is an adjustment layer, a layer blend mode, some blurring, a slider bar, and a couple of minutes of your time. 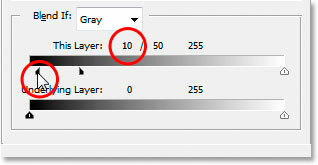 Photoshop's Layers palette showing the Background layer. 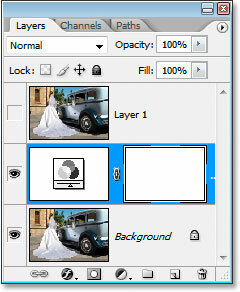 Click the Layer Visibility (eyeball) icon to temporarily hide "Layer 1". 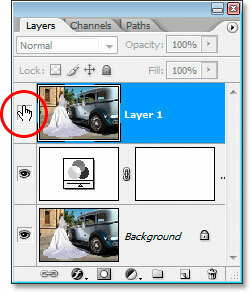 Click on the Background layer to select it, then click the "New Adjustment Layer" icon. Select "Channel Mixer" from the list. 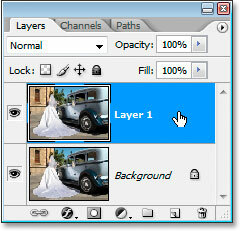 The Channel Mixer appears between the two other layers. We're going to use the Channel Mixer to create a nice black and white version of the image. We could simply desaturate the image, but that usually gives us poor quality results. The Channel Mixer allows us to create our own custom black and white version and adjust it until we're happy with how it looks. Also, by using the adjustment layer version of the Channel Mixer, we're not touching the original image in any way. 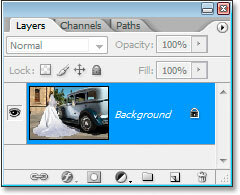 Select the Monochrome option in the bottom left corner of the Channel Mixer dialog box. You'll see the image turn black and white in the Document Window when you select it. 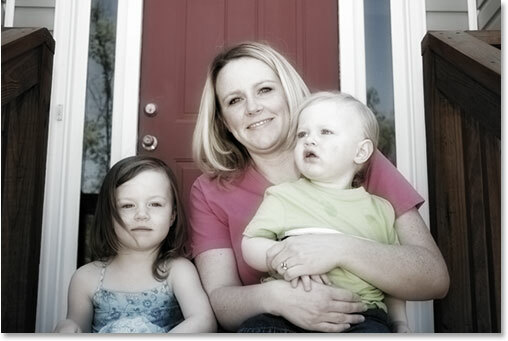 Then drag the Red, Green and Blue slider bars left and right to create a custom black and white version of the image. The idea is to keep all three values totaling 100%, which will give you the brightest possible image without "blowing out" any of the details in the highlights. The values you end up choosing for your image will depend entirely on the image itself. Here I've chosen 10% for Red, 45% for Green and 45% for Blue, which gives me a black and white version I'm happy with. Again, your numbers will depend on the image you're working with. 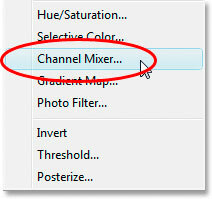 Photoshop's Channel Mixer. Adjust the Red, Green and Blue sliders to create a custom black and white version of the image. If you want to learn more about what exactly these Red, Green and Blue channels are, check out the RGB And Color Channels Explained section of the site. The image after using the Channel Mixer to convert it to black and white. Click on "Layer 1" to select it, then click the Layer Visibility icon to display it in the Document Window. The black and white version is now hidden from view. 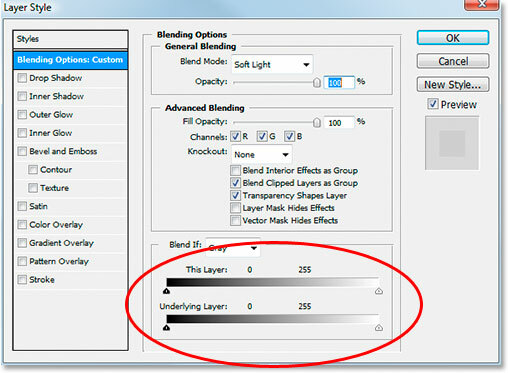 Step 6: Change The Layer Blend Mode To "Soft Light"
Change the blend mode for "Layer 1" to "Soft Light". The image after changing the blend mode to "Soft Light". 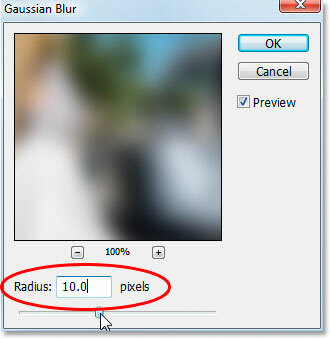 Photoshop's Gaussian Blur dialog box. Enter a Radius value of 10 pixels. Things are looking good, except that I've lost some of the detail in the shadow areas of the image. I need to bring it back, and I'm going to do that by hiding the darkest parts of the image on "Layer 1" and letting the black and white version show through. How am I going to do that? By using Photoshop's Blend If sliders. 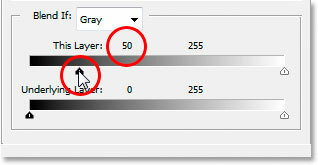 Click the "Add Layer Style" icon at the bottom of the Layers palette. Choose "Blending Options..." from the list. 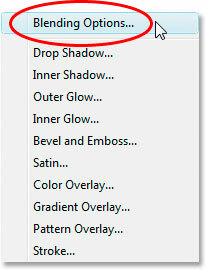 Photoshop's Layer Style dialog box. The "Blend If" sliders are circled in red. Drag the top left black slider towards the right to bring back the shadow detail. Drag the left half of the black slider back towards the left to create a soft transition area in the image. When you're done, click OK to exit out of the Layer Style dialog box, and you've completed the effect! Using a different photo for the effect. 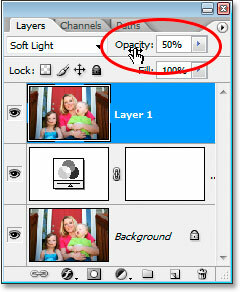 Lower the opacity of the top layer to reduce the amount of color in the image if needed. 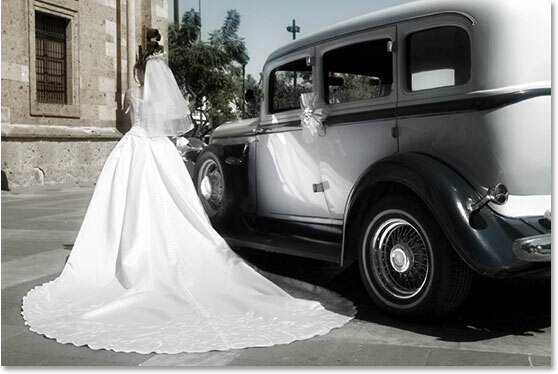 If you need to add more color to the image, simply lower the opacity of the Channel Mixer adjustment layer. Not only is this effect easy to create, it's also easy to adjust and fine-tune as needed. And there we have it! For more old fashioned photo effects, check out our Turn A New Photo Into An Old Photo and Old Paper Background Texture tutorials. Or visit our Photo Effects section for more Photoshop effects tutorials!